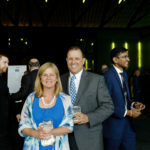 Supporters respond to Archbishop’s Gala 2017 with record-breaking attendance. It can’t be said enough: only through the gracious support of our benefactors is Sacred Heart able to carry out its mission. 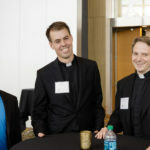 Support for the Archbishop’s Gala, the seminary’s primary fundraising endeavor, is especially important. 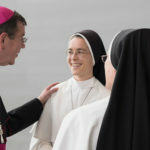 Sponsors and attendees become real collaborators in a shared effort: to form tomorrow’s priests, deacons, and lay ministers to be leaders of a new evangelization in the local church and throughout the world. Supporters again have validated Sacred Heart’s mission with an astounding show of self-giving. Archbishop’s Gala 2017, celebrating its twentieth anniversary, broke the all-time attendance record. 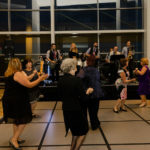 Over one thousand guests enjoyed the evening of celebration, entertainment, prayerfulness, and fun—and it’s the first time attendance reached one thousand. 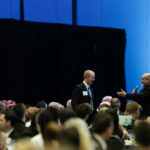 The annual event was held at the Grand Riverview Ballroom of Cobo Center in downtown Detroit on June 16. Grand Riverview Ballroom is well-named. 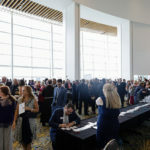 A wall of windows in its reception lobby gave guests a stunning view of the Detroit waterfront and the skyline of Windsor, Ontario, across the river. 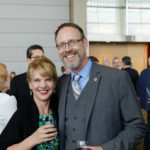 During the cocktail reception, guests strolled through the lobby chatting with old friends and buying up raffle tickets for a chance to a $25,000 cash prize, donated by Weingartz. Congratulations go out to a Knights of Columbus member from Milan Michigan, the lucky winner of the cash prize. 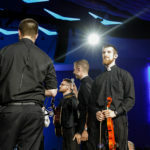 Congratulations also go to the members of the Michigan Knights of Columbus for their annual ticket-selling efforts in support of the seminarians. During the reception, generous guests opened purses and wallets to purchase 52-Card Raffle tickets for a chance to win gifts donated by edmund T. Ahee Jewelers, Showerman’s Fine Wine and Liquor, Tom and Carol Cracchiolo, Corporate Travel Service, and friends of Sacred Heart. 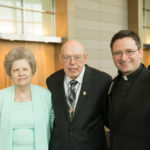 Many guests took the opportunity to have their photos taken with host Archbishop Allen Vigneron. Splendid choral and orchestral work enhanced the cheerful mood, performed by students from St. Catherine of Siena Academy of Wixom, Michigan. The main program in the ballroom began at seven o’clock with a welcome by rector Msgr. Todd Lajiness. 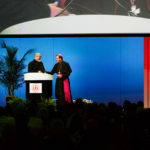 Next came an attention-grabbing video, “Shift.” It focused on Archbishop Vigneron’s call for the people and parishes of the archdiocese—and especially the archdiocese’s central services—to shift focus: to become more “mission-driven” and less “maintenance-driven.” A second video shown later in the program, “Be Not Afraid,” presented an inspiring depiction of the mystical call to serve the Church as a priest. Fr. Joseph Krupp then gave a humorous program introduction. 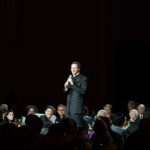 The Sacred Heart alumni and priest of the Diocese of Lansing—who once was a television comedy writer—emceed the gala for the second year in a row. 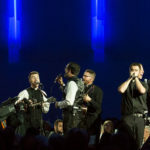 Exclusive sponsors of Archbishop’s Gala 2017 were the Michigan Knights of Columbus, Weingartz, Trinity Charitable Fund, St. Catherine of Siena Academy, Christian Financial Credit Union, Saint Joseph Mercy Health System, Ave Maria Mutual Funds, Alpha & Omega Laser, LLC, Corporate Travel Service, Genthe Automotive, and Mersino. Hour Detroit Media, Allied Rethink Ink, and Nu-tech Graphics & Systems were also sponsors. What can we say but “thank you” to everyone—attendees, sponsors, raffle donors, and program advertisers—who made the event such a success? 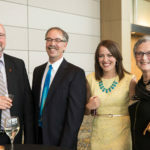 Why not mark your calendar now to attend the Twenty-first Annual Archbishop’s Gala on Friday, June 15, 2018? It’s great fun for a great cause. Archbishop Vigneron, Monsignor Lajiness, and the seminarians of Sacred Heart hope to see you there. 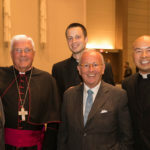 To watch photo and video highlights of Gala 2017, please visit archbishopsgala.com.